Today is the 70th anniversary of the Deir Yassin massacre, one of many committed in the vicious frenzy of the Zionists’ land grab. Here is an account of that appalling event. 9 April 1948 was before the state of Israel was declared. But already atrocities were being committed as Jewish militia and terror gangs tried to seize as much key territory as possible, overrunning the boundaries set out in the UN’s 1947 Partition Plan. 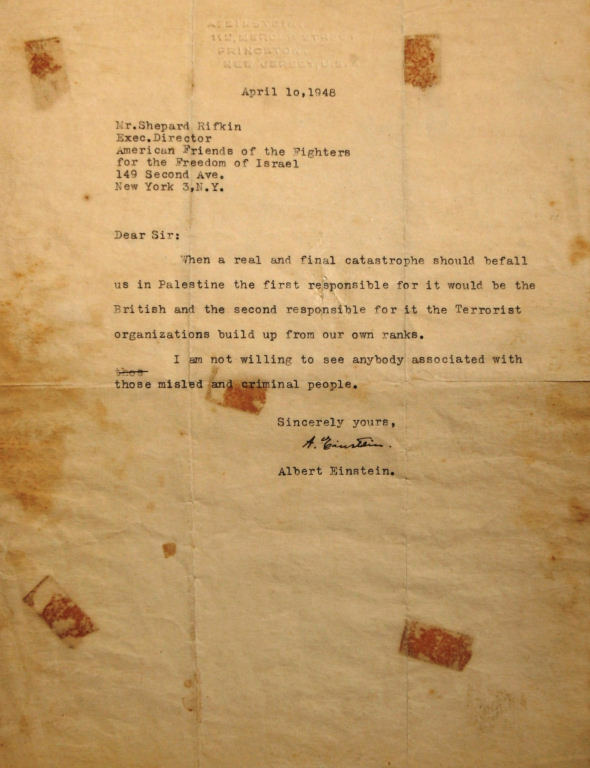 The next day Albert Einstein penned this letter to the director of American Friends of the Fighters for the Freedom of Israel which raised money to support Jewish terrorists such as the notorious Stern Gang and had tried to solicit Einstein’s help. In it Einstein blames responsibility for the coming catastrophe on the British and the terrorist organisation from the Zionist Jews’ own ranks, saying he would not see anyone associated with those “misled and criminal people”. Which goes to show that you don’t have to be a genius to know who caused the current misery and strife in the Holy Land. This article was posted on Monday, April 9th, 2018 at 12:44pm and is filed under Israel/Palestine, Land Theft, Massacres, Terrorism (state and retail), Zionism.